SILICONIX, represented by Braemac , has announced the release of seven new low voltage, high performance analogue switches, including a single-pole/double-throw (SPDT) switch that boasts a 1.6mm by 1.6mm package footprint. These new additions to the DG2000 series of analogue switches are designed for routing and selecting signals in battery-operated and portable audio, video, and data equipment, such as cell phones, in which small size and low power consumption are critical. A new high-density CMOS process improves device performance for lower on-resistance, better on-resistance flatness, high off-isolation, lower cross-talk, and wider bandwidth. Supplied in surface-mount packages that reduce space requirements and improve circuit board density, the new analogue switches are available in single, dual, and quad configurations to suit a wide array of applications. All the devices are characterised for operation from 1.8V to 5.5V power supplies. The new DG2011 SPDT analog switch features a six-lead SC-89 package (industry-standard SOT-666). Occupying a 1.6 mm x 1.6 mm footprint, the SC-89 provides board area savings of 40% more than devices in the SC-70 with a height profile that is 55% thinner. With 1.8Ω on-resistance and a charge injection of less than 10pC over the entire analogue voltage range, the DG2011 is useful for audio output switches in portable battery-powered systems. 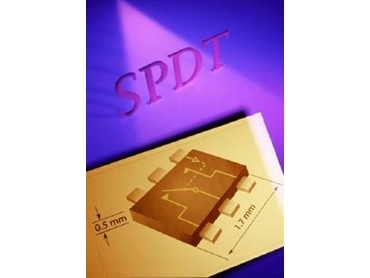 The DG2016 and DG2031 are dual SPDT analog switches in MSOP-10 packages. The DG2016 is designed specifically for low-voltage, high-bandwidth applications, with on-resistance (3Ω at 2.7V), matching, and flatness guaranteed over the entire analogue voltage range. The device achieves wide dynamic performance with better than -80dB for both cross-talk and off-isolation at 1MHz. Fast switching speeds, low on-resistance, high bandwidth, and low charge injection make the DG2016 well suited for audio, video, and data switching requiring high linearity. The DG2031 provides a sub-1Ω on-resistance (0.75Ω at 2.7V) and excellent matching between the two switches (less than 0.05Ω at 2.7V) while guaranteeing flatness (less than 0.2Ω at 2.7V) over the entire voltage range. The new switch also features a low logic threshold voltage for easy interface to low-voltage DSP signals. Also among the seven devices announced are four quad, low-voltage analogue switches (DG2015, DG2041, DG2042, and DG2043) in the small 16-pin QFN leadless package measuring just 4mm by 4mm. The DG2015 is a dual double-pole/double-throw (DPDT) switch with on-resistance of 0.8Ω, charge injection of less than 15 pC, and cross-talk and off-isolation of -70 dB. With a differential configuration, the DG2015 is intended for portable audio systems, such as personal music players, that implement stereo speakers. The DG2041, DG2042, and DG2043 are low-on-resistance single-pole/single-throw (SPST) analog switches. Combining 1.6Ω on-resistance, 3pC charge injection, and less than 20ns turn-on and turn-off, these switches are intended for applications in which signal switching accuracy, low noise, and low distortion are critical.